Winter squash in the spring? Yes! Most people associate winter squash with, well, winter, so by the time February or March rolls around, it’s as far in the rear view mirror as Halloween and pumpkin pie. Plus, most varieties are huge, great for the big feasts of autumn but not for lighter spring meals. But still, the warm, comforting flavor of squash and what it can add to recipes year-round doesn’t change, so we began casting around for varieties that tasted great, stored well, and didn’t cast the shadow across the landscape that their larger cousins did. And I’m happy to say we found some! Tetsukabuto and Winter Sweet are delicious and juuuuuust right in size. We planted them in the summer, harvest them in the fall and then store them for a bit – squashes continue to ripen when stored properly (as we do, of course!) – and now they’re at their peak of flavor and great eating. By the way, you won’t see either of these varieties in stores – only in your CSA shares! – so enjoy the extra taste of eating something unique and local, in addition to delicious! Comments Off on Winter squash in the spring? Yes! 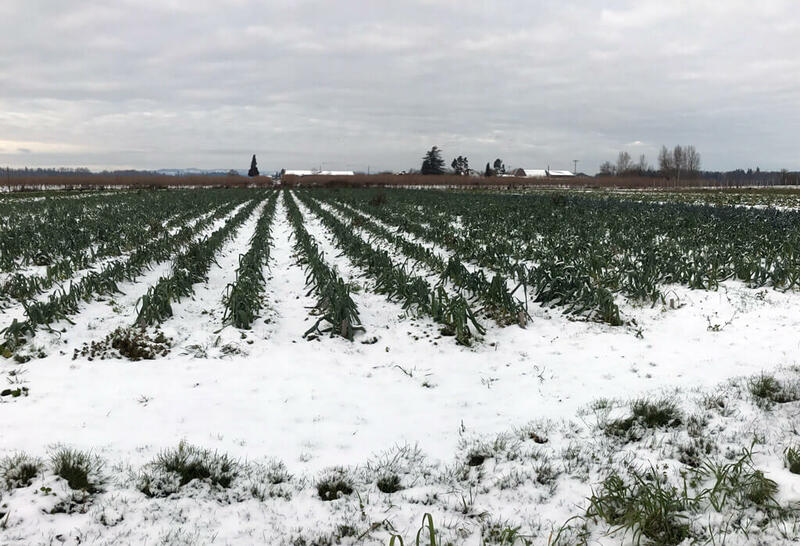 Boy, what a winter we’ve had – sub-freezing temperatures, deep blankets of snow, and ice, ice baby. So a lot of folks have been asking me: didn’t all our vegetables freeze? The short answer: they didn’t, and the reason why is a combination of botany and our 20 years’ experience with cold winters. 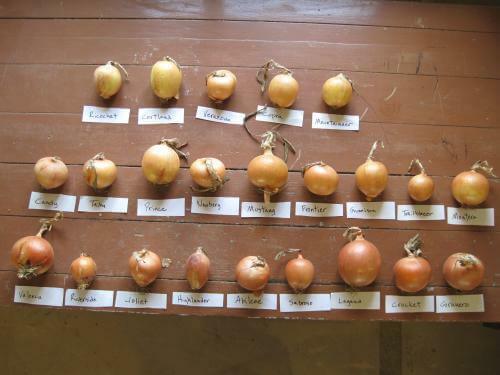 We were one of several farms working with OSU last year on yellow storage onion variety trials. 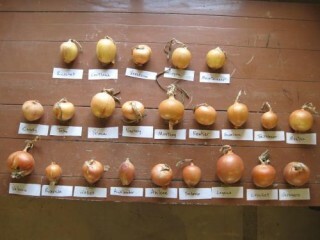 They haven’t finished crunching all the numbers, but I did get this photo of all 23 different onions which I thought was interesting. I’ll post more info when I get it. Hippocrates offered the advice, “Let food be thy medicine and thy medicine shall be thy food,” in 400 BC. Today in the modern capitalist world, it seems that these wise words may have been forgotten. Fortunately with the revival of small scale farms and the creation of community supported agriculture, people are once again gaining a powerful connection to food. When one holds this connection close to them, the healing properties of everyday foods become apparent. As the season changes, some of you have already tasted the beginning of the winter splendor soon to come. Who needs to visit the drug store I ask you, when we have so many delicious types of winter squash? Winter squash, such as the acorn squash or snack jack pumpkins that you received recently in your share, are known in Ayurvedic medicine to be warming foods that keep one healthy during the colder seasons. Additionally, the high levels of phytonutrients in these foods have been shown to have anti-carcinogenic effects. Beta-cryptoxanthin and beta-carotene are responsible for the rich orange colors of winter squash in addition to their roles as antioxidants that lower the risk of cancer; particularly those of the pancreas and stomach. Beta-carotene also helps to prevent the oxidation of cholesterol that can clog blood vessels and result in heart attack or stroke. Besides for these important factors, the flesh of winter squash acts as an anti-inflammatory that can soothe many conditions ranging from burns to asthma to arthritis. If you burn yourself baking pie this Thanksgiving, save some of the pumpkin flesh to use as a poultice. Place the pumpkin flesh on the burn to ease your pain and facilitate healing. Mashed squash can also be used topically as a face mask to moisturize skin. Bob Sallinger and I are running unopposed but of course I’d encourage you to vote for us too! For more info on the candidates and their positions check out the Portland Mercury and the Multnomah County Elections site. Let democracy reign!